For a man who drew national fame in part because of his clever use of social media while mayor of Newark, Cory Booker’s message for his 2020 bid most certainly does not match the mood of today’s political Twitter. In his first journey to Iowa after his presidential campaign announcement, Booker stuck to an optimistic and aspirational homily, inviting the audience to join him in a fight to make America a more loving and caring place again. It’s the philosophy of public service that has driven Booker’s entire life, from his years trying to mentor gang members while living in a public housing project to his bipartisan efforts on criminal justice reform in the Senate. 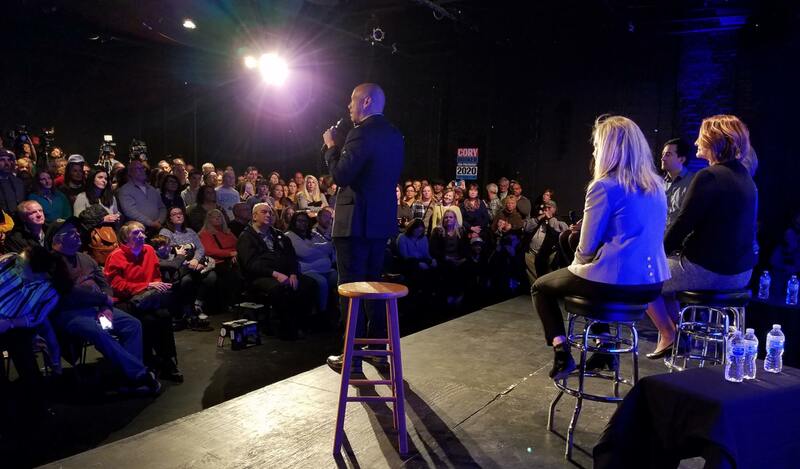 “The larger call is not just how we beat Republicans, but how we unite all Americans in the cause of our country,” Booker said at his event in Des Moines. It’s also a sharp contrast with the current zeitgeist of left-leaning activist social media and political journalism, which can often be fueled by reactionary anger. There’s also plenty of people in the Democratic base that is wary of reconciliation talk after Republican lawmakers undermined Barack Obama’s presidency with partisan gridlock. One of the members of Booker’s panel in Des Moines, State Representative Jennifer Konfrst, put the question bluntly to the senator. “Twitter tells me positive’s not going to win this time. Can you tell us why it will?” she asked. Will that approach work? Well, it depends on how much of the Iowa Caucus results get dictated by the national narratives. Make no mistake: even if you’re not a news junky, cable news-watcher, or active Twitter user, the weird dynamics of the national conversation can easily seep down into your local consciousness and impact how you view a candidate. A single headline or errant tweet can derail the narrative around a campaign. Just one Politico headline about Elizabeth Warren’s “likability” framed the debate around her first week of campaigning (it was mostly people defending Warren, but it still kept the focus on that topic). And so often, political Twitter gets driven by outrage and reactions. You can usually get a lot more re-tweets by attacking some Republican than by saying what you like about a Democrat. But there is a significant portion of the Democratic electorate that lives outside of that world, and maybe their underlying values could still play a larger role. It’s happened in Iowa before. Barack Obama preached a message of hope and unity during his 2008 run, while Hillary Clinton promised to “turn up the heat” on Republicans if elected. There was a ton of anger among Democrats over the Iraq War (though probably not as intense as the current ire directed at Trump), yet Obama’s pitch still won out. And had you been listening closely to actual Democrats’ thoughts on the ground back then, you would have known that was the right approach. Would the national conversation had noticed it too? Actually, it’s rather interesting to ponder how the 2008 primary might have played out had Twitter been a bigger conversation driver back then. How differently would the Democratic base’s views on George W. Bush been, and which candidate’s talking points should have spread on social media more rapidly? 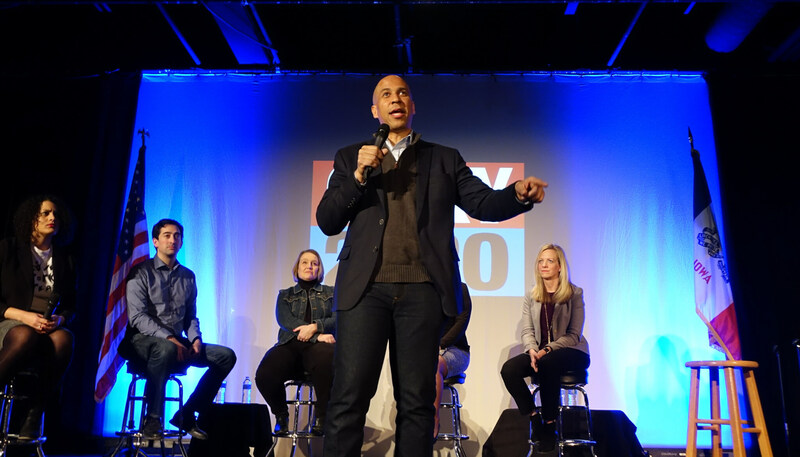 Booker already had some success in this last October, when he addressed the Iowa Democratic Party’s biggest fundraiser of the year several hours after Brett Kavanaugh got voted onto the Supreme Court. Despite a room full of rage over the news, Booker’s love and unity speech went over well and left many attendees more hopeful as they left that night. It’s also noteworthy that many of the 2018 congressional campaigns rarely mentioned Trump in their TV ads, and Democratic voters were still plenty eager to volunteer and vote for those candidates. Does the party’s nominee need to constantly torch Trump if everyone’s already there? 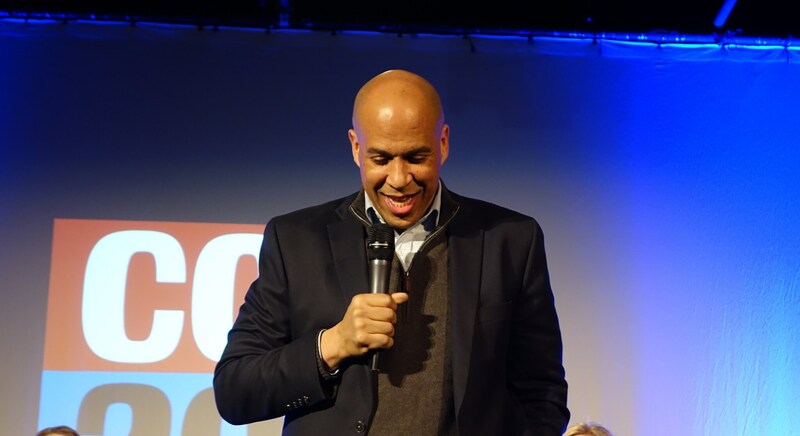 “I’m offended by American cynicism,” Booker declared in Cedar Rapids, and it certainly would take a more optimistic view of American politics to see how this succeeds in 2020. It’s not like Booker can really change his approach that much given that his entire persona revolves around this outlook. But just as Bernie Sanders’ lifetime of progressive policy ideas had their moment just as he ran for president, perhaps Booker’s message could cut through in a way many don’t expect. If it does, you probably won’t find the early warning signs on Twitter. Committee and he worked with Sen. Grassley on new laws. right time to restore our faith and honor in America. I agree with the prior comment and am impressed by Cory Booker. I think he has a good chance, given past patterns concerning the individuals elected president. The electorate vacillates in what it wants in a president. You had a detailed policy wonk in Clinton, followed by a broad brush and non-cerebral approach with Bush W., followed by a cerebral presidency with Obama, followed by an ignorant, racist and ranting Trump. Booker probably stands in starkest contrast, on a personal level, to Trump with his message of unity and reconciliation.